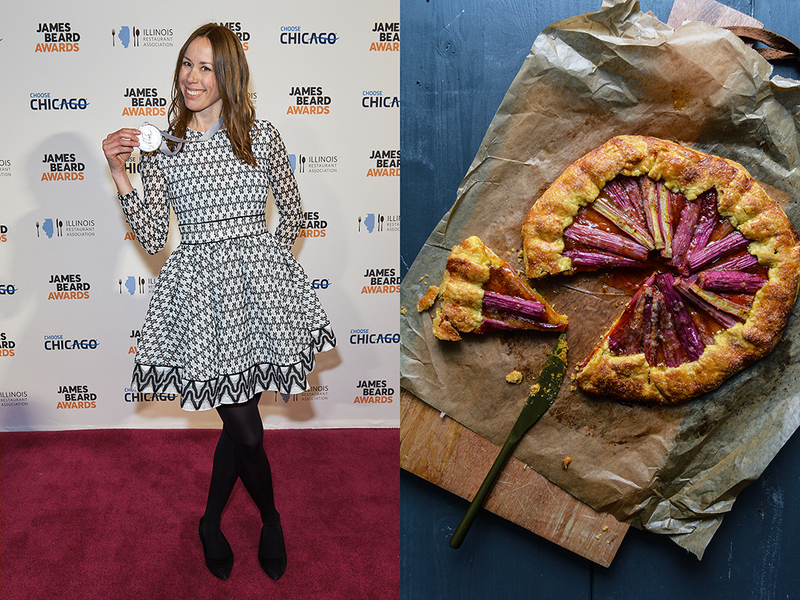 Rhubarb Corn Galette with Saffron & we won the James Beard Award! Last Tuesday we won the James Beard Award. 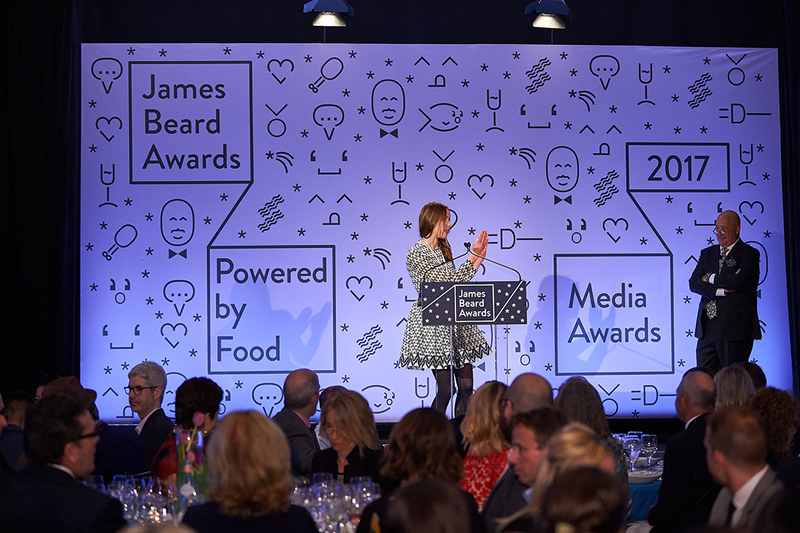 I flew to New York thinking that I had no chance of winning – Ina Garten was nominated in the same category as me: General Cooking. I was sure that this was not going to happen. And now I’m sitting here at JFK airport, writing these words while waiting for my flight back to Berlin. Trying to think clearly, but I can’t. I wish there were words to describe how I feel, or at least give you a vague idea of what this means to me – but I can’t. It’s almost impossible to talk about a feeling that still shakes me up every time the memories come back and makes my heart fall as if I’m jumping of a cliff. It’s not just in my mind. I feel physically overwhelmed. 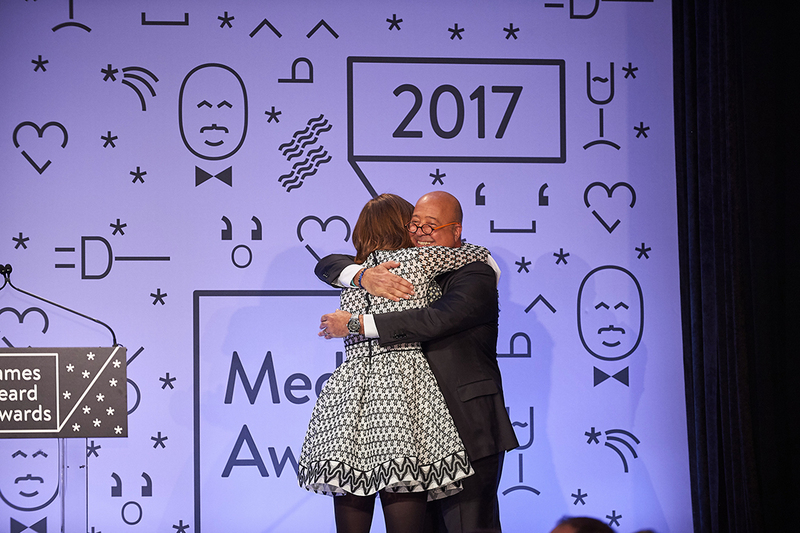 Just like I did when I went on stage to fall around our host Andrew Zimmern’s neck, to kiss and squeeze him, and to receive the James Beard Foundation medal from his hands (watch my speech here). Nothing would be as it is without my man, Jamie; my editor Holly La Due who guided me through the past two years since we first spoke about a cookbook – and she held my hand in these endless painful seconds before my name was announced at the awards ceremony by legendary Andrew Zimmern; my mother who passed her love for food and wine on to me, the seed out of which Eat In My Kitchen grows every day; everybody at Prestel Publishing and our external experts Lauren Salkeld, Jan Derevjanik, and Ron Longe, who gave everything to make this book look as it looks and stand where it stands. And my family and friends all over the world, your belief in me makes me grow every day. Thank you for trusting me, and for waiting for me patiently. 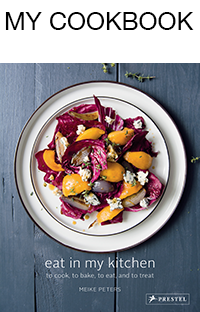 When your work is recognized and awarded by one of the most critical juries in the food world, a jury who’s not interested in numbers or celebrity status, but in the quality of recipes, it can easily feel intimidating. But that rainy night at New York’s Chelsea Piers was not intimidating at all, it was magical. 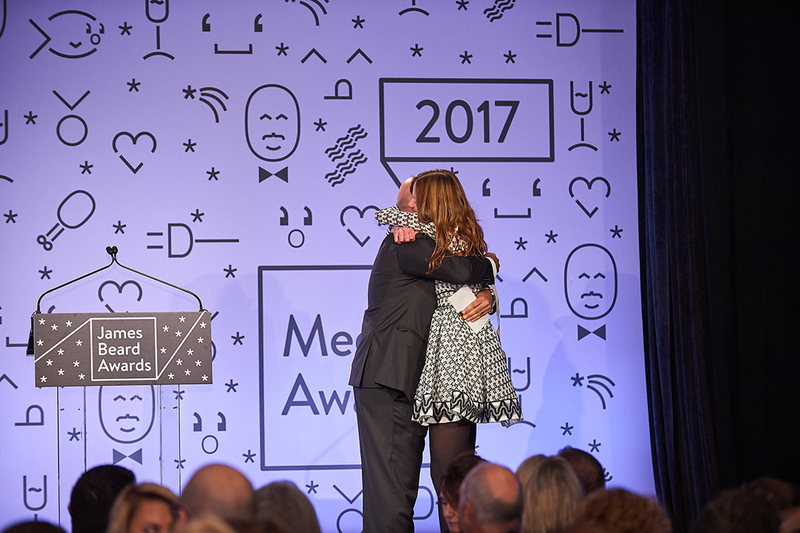 I was in a room together with so many talented people who all love what I love so much – food – and I experienced the warmest welcome to this family (a word that winner Dori Greenspan used). There’s a lot of respect, a humble appreciation of the work of the others. 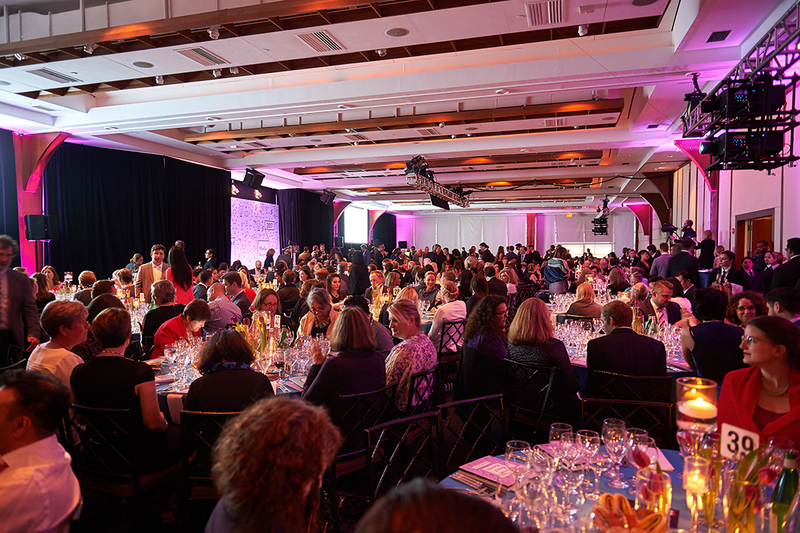 Ronni Lundy, Dori Greenspan, Andrew Zimern, Pierre Koffmann, Naomi Duguid, Judith Jones, Keith Pandolfi, Francis Lam and many more (here’s the full list of winners), we were awarded for our work, and everybody who came to this event came to celebrate us, but also a passion that we share and that connects us, no matter what part of the world we come from. 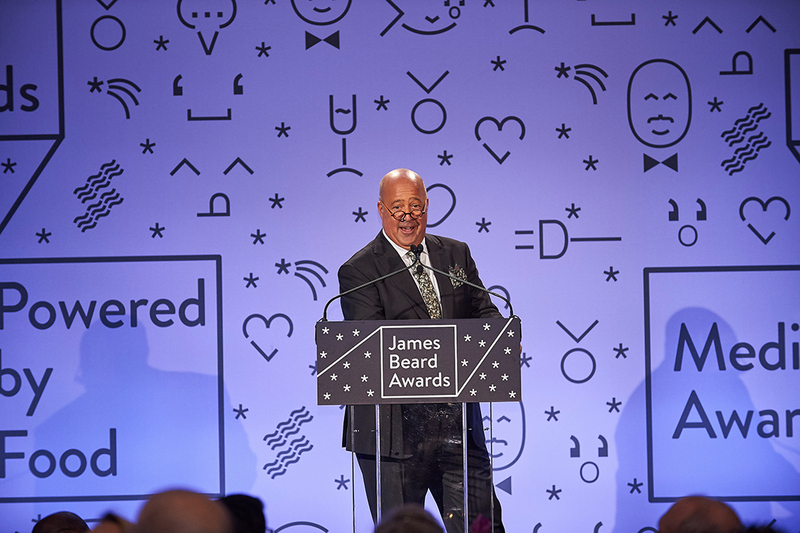 I want to thank the James Beard Foundation and all the inspiring people who I met that night, a night that I’ll never forget in my whole life. Knowing that I wouldn’t be able to cook or bake anything to share with you when I came back, I made a galette (twice actually because it’s so good) just a few days before I left. It’s a spring treat and it’s quite a spectacular one. 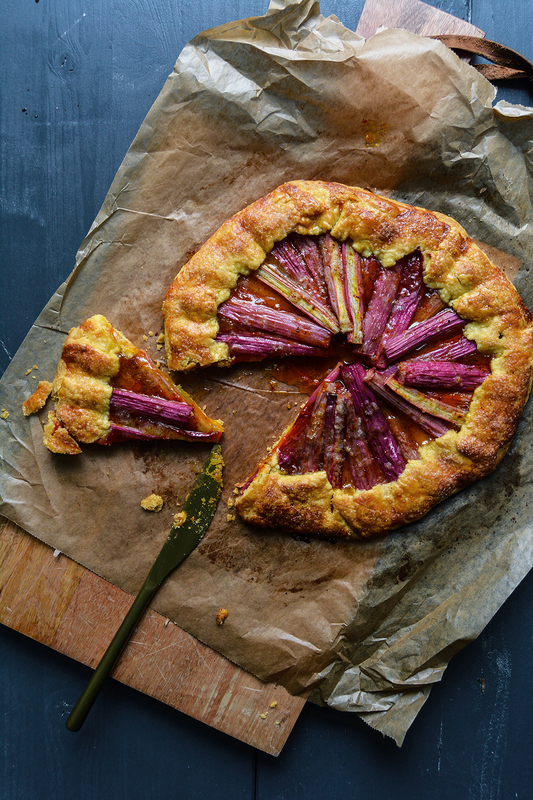 A crunchy short crust base made of corn flour and spelt flour (you can also use wheat), topped with sour rhubarb and the most fragrant saffron sugar. Cookbook author Yossy Arefi introduced me to this golden spice sugar and inspired me to use it for various sweet pies. 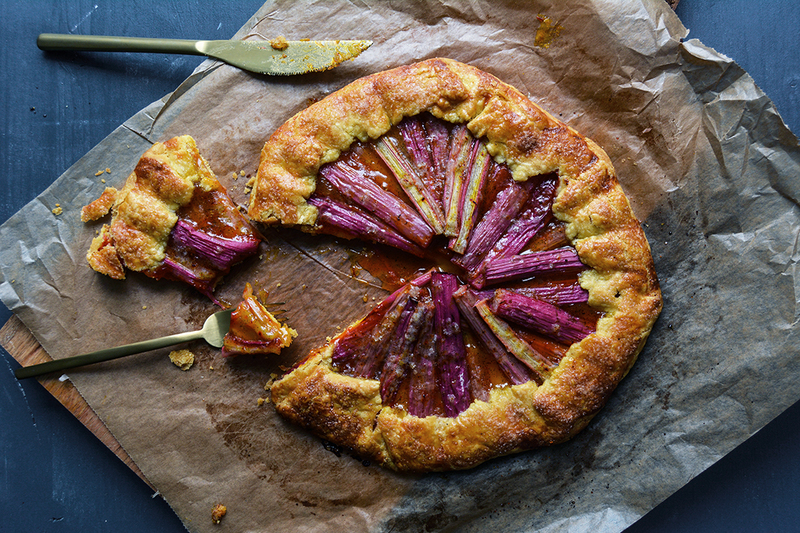 Last summer I wrote about her berry galette and I will never forget how the addition of saffron to fruit and buttery crust hit me. It’s a true celebration cake. And now I want to thank you for always pushing me to try out new things in my kitchen, to keep cooking, baking, and writing about what we all love so much. Food! 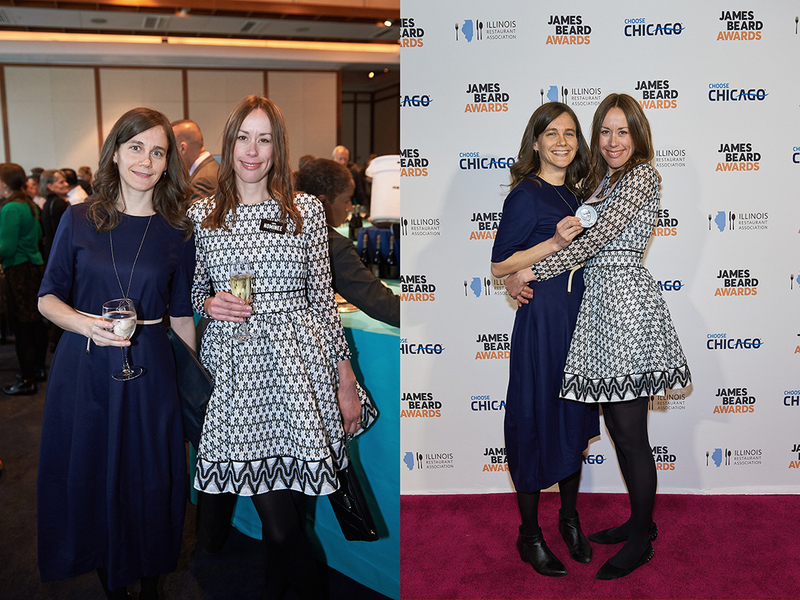 Photos of the James Beard Award Ceremony by Kent Miller Studios, c/o the James Beard Foundation. Mind that it’s best to prepare the dough for the galette the day before you bake it to give it enough time to chill in the fridge. Makes one 23cm / 9″ galette. For the pastry, in the large bowl of a stand mixer fitted with the hook attachment, combine the corn flour, flour, sugar, and salt. Add the butter and use a knife to cut it into the flour until there are just small pieces left. Quickly rub the butter into the flour with your fingers until combined. Add the water and vinegar and, using the hooks of the stand mixer, mix until combined. Form the dough into a thick disc, wrap it in plastic wrap, and chill in the fridge overnight (or for a few hours) until hard, or freeze for about 20-30 minutes. On a table or countertop, place the dough between 2 sheets of plastic wrap and use a rolling pin to roll it out into a 30cm / 12″ circle. Pull off the top layer of plastic wrap and replace with a piece of parchment paper. Flip the pastry circle over, transfer to a wooden board, and pull of the remaining layer of plastic wrap. Store the pastry (on top of the wooden board) in the fridge while preparing the topping. Using a mortar and pestle, grind the sugar, vanilla seeds, and saffron until the saffron is fine and the mixture is well combined. Stir in the flour and salt and set aside. Cut the rhubarb into 10cm / 4″ long pieces and quarter each piece lengthwise. 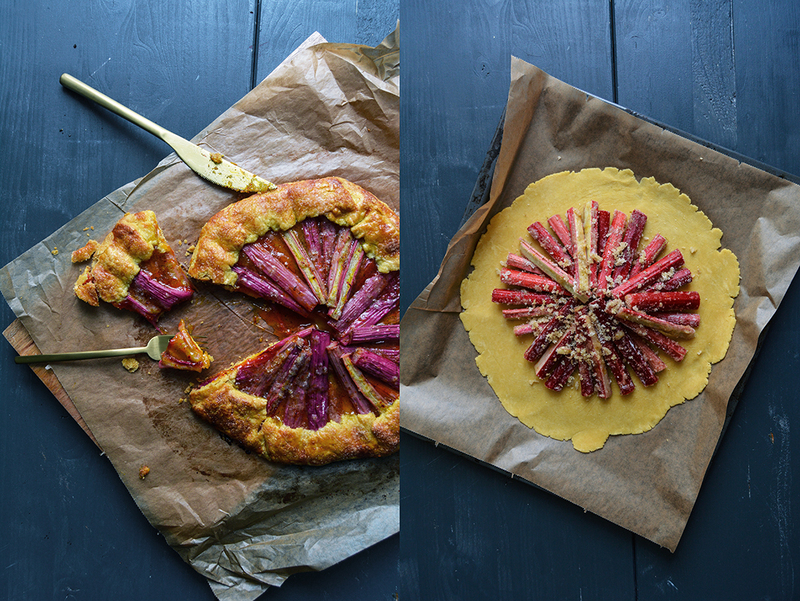 In a large baking dish, using your hands, toss the rhubarb, saffron-sugar, and lemon juice. 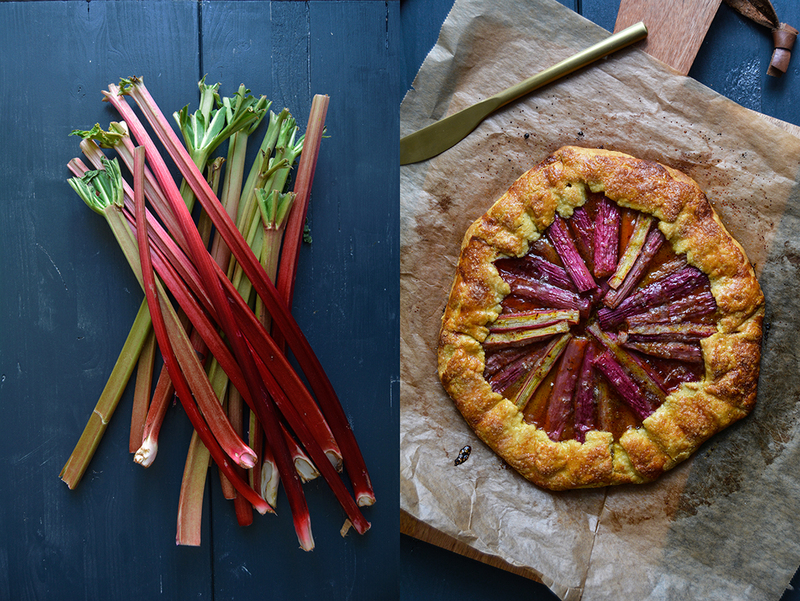 Take the pastry out of the fridge and arrange the rhubarb, overlapping, in a circle on top of the dough, leave a 5cm / 2″ rim all the way around the fruit (see 10th picture). Sprinkle with any remaining saffron-sugar. 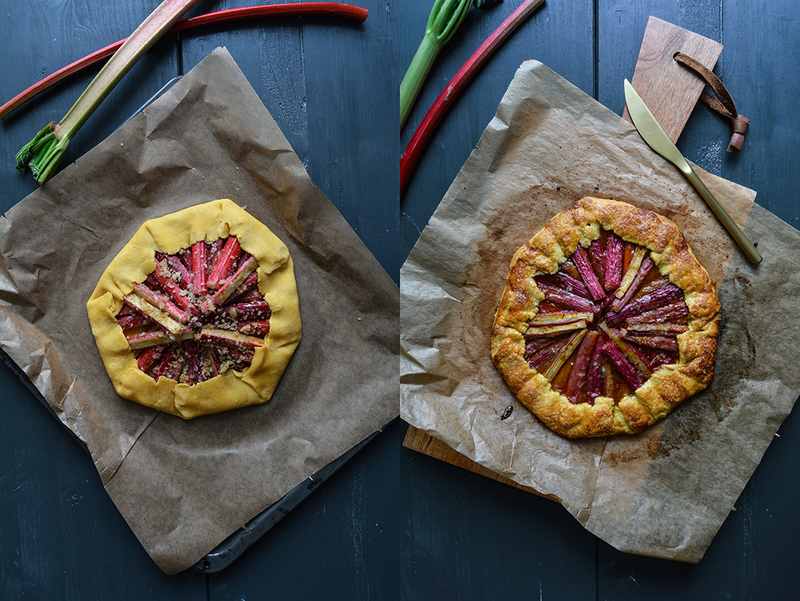 Fold the edges of the pastry over the ends of the rhubarb, press to seal the folds. Chill the galette in the fridge for about 10-15 minutes or until the pastry is firm. Preheat the oven to 200°C / 400°F (conventional setting). Place a baking sheet in the middle of the oven while preheating. Brush the pastry with the egg wash and sprinkle with 1 teaspoon of sugar. Take the hot baking sheet out of the oven and pull the galette with the parchment paper onto the baking sheet. Bake for about 30 minutes or until golden brown. Let the galette cool for about 10 minutes before cutting. Serve warm or cold. It is not in the book, correct? No, I came up with the recipe after the book was published. Congratulations on your award. I enjoy reading your posts and your recipes are always so interesting. I am looking forward to seeing what is yet to come. you mentioned “freshly squeezed lemon juice 1 tablespoon” in ingredients for the gallete. Where or how do we use it in recipe? I did not find it in instructions. Congratulations! The award is well-deserved for such a beautiful book. 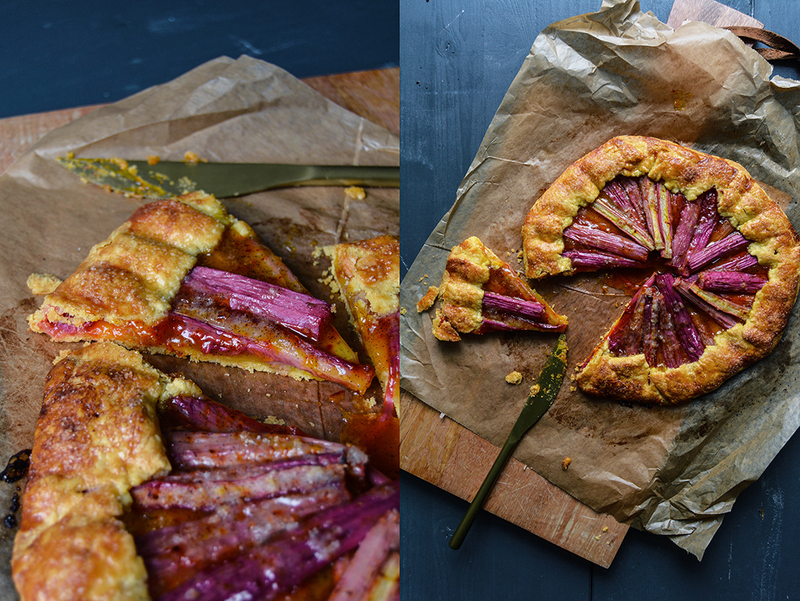 And this Rhubarb Gallette looks wonderfu! I have rhubarb in my garden, so I can definitely make this. That is sooo wonderful, Meike ! Congratulations !! recipes which you develop – paid off !